Windchimes, like baguas, is a fundamental tool used in authentic Feng Shui. The advantage of a windchime is that it can be used internally to dissolve killing energy (shar chi). Windchimes are unquestionably the most powerful enhancer and cure for many Feng Shui situations. Windchimes are potent enough to maneuver and enhance chi wherever it is placed. They make a significant presence especially for those who do not want to spend too much money to modify buildings and large structures due to bad Feng Shui. Properly designed windchimes according to the rules of the nature do not invite ghost, but instead will chase away evil spirits with the tones and melodies of metal energy. 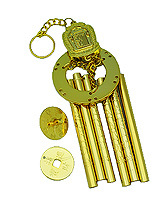 For example 5 Yellow is an evil energy, and a strong metal windchime will scare it away! Click here to learn more about windchime and how to apply it in your Feng Shui! 1. Sun and Moon Pagodas - Firstly, Five Element Pagoda signifying 5 Elements is a symbol to subdue #5-Yellow (Fatal Star) and #2-Black (Illness Star). Next, the Sun and Moon symbols activate the lunar and solar currents of the year. 2. Garuda - known as the mythical lord of the birds. the great powered Garuda defeats demon spirits that bring illness, setbacks and obstacles to success. Therefore, Garuda is an esteemed destroyer of 5-Yellow (a demon). Feeding on powerful serpents and nagas, no naga is able to survive Garuda's grip or bite. Garuda's triple sadhana (practice of three deities) is highly effective for removing obstacles or illnesses, especially naga-related afflictions such as kidney failure, plague and cancer. Therefore, Garuda is a revered cure for contagious diseases and deadly illnesses. 3. 8 Auspicious Objects - are also an important antidote for killing energy, especially for cases where doors are all aligned in one straight line, maindoor opens to a garage, the staircase is facing or too close to the maindoor, the doors are aligned facing each other in a straight line and bad external forces pointing to a specific area of the house. 4. "Exalted Mantra King of Great Breath" is the anecdote to diseases sent out by the breath of the great lord of all the spirits of all 3 continents called Grinning Teeth (sekpa). All humans and spirits living in the world may contract various sicknesses and having their lives taken away once the destructive breath fills up the whole world and touches sentient beings. Whenever the mantra is worn, touched or kept, sentiant beings will not be harmed by the breath, protecting you against contagious diseases (including the infamous Ebola), receiving no harm or sicknesses (tongney) from wind, bile, phlegm etc. This is a must have if you are getting on board a flight or travelling to contagious countries. 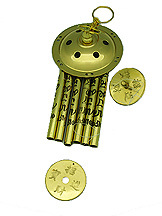 The six rods windchime actually denotes "Chien Hexagram" which carries the meaning Big Metal and luck from heaven. It is also a potent cure against visible and invisible "shar chi" such as poison arrows and annual afflictions. These powerful combinations of all the above prevent malevolent energies from stealing away your life force. This is exactly what is needed to powerfully subdue the negativities from #5-Yellow and #2-Black. All in all, this windchime transforms bad energies into positive vibes, build protection from the 5 cardinal directions, eliminate afflictions and overcome evil. This six rods windchime features the "4 Heavenly Kings", the "Tenfold Powerful One" and "8 Auspicious Objects" to transform bad energies into positive vibes, build protection from the 5 cardinal directions, eliminate disasters and overcome evil. The six rods windchime actually denotes "Chien Hexagram" from the studies of I-Ching which carries the meaning Big Metal and luck from heaven. The windchime sought the assistance of "Cosmic Protectors" to pulverize all negative forces and clear blocked pathways. Having great control over the cosmic elements of each of the four directions North, South, East and West, the "Four Heavenly Kings" carrying their special implements which they wield their miraculous power, guard against loss of wealth, loss of popularity, loss of life and loss of health. Incredibly powerful, they ward off the terrible potential for reversal of fortunes. Some afflictions, pesky stars and evil spirits tend to bring a host of problems big and small such as misfortune, financial loss, hostility, accident, treachery, duplicity, untrustworthy friends, disaster, danger, ghostly encounter, injuries, violence, mysterious sickness and black magic. These unseen forces only fear the Cosmic Protectors and Enlightened Beings that ward off all odds, misfortune, devastation from unlucky stars and annual afflictions. Empowering and consecrating the primary piece is the "Mantras of 4 Heavenly Kings". Equally important, the Tenfold Powerful One (Kalachakra Symbol) is an ultra strong antidote for killing energy and evil forces. It is often used as cures for difficult situations when other cures become helpless, in situations that may possibly carry misfortunes, disasters and accidents if not properly remedied. It is also a potent cure against visible and invisible "shar chi" such as poison arrows and annual afflictions. Last but not least, the "Eight Auspicious Objects" are also an important antidote for killing energy, especially for cases where doors are all aligned in one straight line, maindoor opens to a garage, the staircase is facing or too close to the maindoor, the doors are aligned facing each other in a straight line and bad external forces pointing to a specific area of the house. They are mantras of good fortune, immunity against loss and shielding off dark forces. This special cylinder radiates peace, kindness, and provide relief from suffering for all beings. Benefiting the entire household, it helps bring happiness to you, your home, and to all beings. It helps transform your home into a very peaceful, pleasant and holy place. And it helps to heal sickness and protect you from diseases. This windchime is required to counter problematic earth energy from flying stars #2 and #5, whether they are of natal, annual or monthly nature. Featuring six genuine brass bells that are struck from outside (no clapper inside), this windchime does more than what the normal six rods windchime can do. Bells are believed to scare away potentially harmful ghosts and evil spirits. Six bells connote the "Chien Hexagram" of I-Ching which carries the meaning Big Metal and luck from heaven. This hexagram exerts the strongest form of metal energy which is required to counter problematic earth energy. On the other hand, the "8-Spoke Dharmachakra" is an ultra strong antidote for killing energy and evil forces. It is often used as cures for difficult situations when other cures become helpless, in situations that may possibly carry misfortunes, disasters and accidents. It is also a potent cure against visible and invisible "shar chi" such as poison arrows and annual afflictions. Next, the lucky windmill never fail to establish success and stability within a household. It is used as protection against all odds, obstacles and dangers to shield one against bad intentions from others. With the ability to blow away challenges and troubled energies, this lucky windmill creates favorable fortune in all aspects of life such as career, wealth, health and overall well-being. The weight below features the "tai chi" symbol, an emblem of balancing yin and yang energies. Favored by feng shui masters, the windchime is known to be the easiest way to remedy flying star problems. Featured with two blue rhinoceros, it blissfully sends powerful energy to counter armed robbery, violence, office politics, backstabbing and business competitors. Consisting of 8 molded mantra rods inscribed clearly with the all-time-favorite "Om Mani Padme Hum" and gilded with gold, it provides a special channel to the cosmic realm to invoke divine blessings. "Eight rods" is a connotation of "prosperity" and is suitable to prevent financial loss. 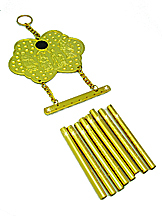 The eight rods windchime is also the most widely used windchime throughout Period 8 (2004-2023). On the other hand, the rhinoceros duo is especially useful in protecting those whose zodiac luck suggests vulnerability of getting robbed or facing financial losses.This windchime is best displayed in the sector of annual Violence Star #7. For eg. in 2016, the direction of this notorious star is in the North. Exerting powerful energy from the tinkling sound of metal hitting on metal, this six rods windchime has 6 mantra rods inscribed with "Om Mani Padme Hum", providing a special channel to the cosmic realm to invoke divine help to transform bad energies into good vibes. 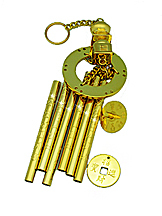 The six rods windchime actually denotes "Chien Hexagram" from the studies of I-Ching which carries the meaning Big Metal and luck from heaven. This hexagram exerts the strongest form of metal energy which is required to counter problematic earth energy from flying stars #5, whether they are of natal, annual or monthly nature. Astounding in esthetics, the primary piece captures the amazing bond between the Three Warrior Brothers (Kwan Kung, Liu Bei and Zhang Fei) and Three Cosmic Symbols (5 Element Pagoda, 8 Auspicious Objects and Kalachakra). This is apowerful remedy in situation when 5-Yellow and 3-Killings come together from the same direction, eg in the west direction in 2015. Exerting powerful energy from the tinkling sound of metal hitting on metal, this six rods windchime has 6 mantra rods inscribed with "Om Mani Padme Hum", providing a special channel to the cosmic realm to invoke divine help to transform bad energies into good vibes. The six rods windchime actually denotes "Chien Hexagram" from the studies of I-Ching which carries the meaning Big Metal and luck from heaven. This hexagram exerts the strongest form of metal energy which is required to counter problematic earth energy from flying stars #5, whether they are of natal, annual or monthly nature. Astounding in esthetics, the primary piece captures the amazing bond between the Tenfold Powerful One and the 5 Element Pagoda. Empowering the primary piece is the mantra of White Umbrella Goddess which can dissipate black magic and demons. The Tenfold Powerful One (Kalachakra Symbol) is an ultra strong antidote for killing energy and evil forces. It is often used as cures for difficult situations when other cures become helpless, in situations that may possibly carry misfortunes, disasters and accidents if not properly remedied. It is also a potent cure against visible and invisible "shar chi" such as poison arrows and annual afflictions. Next, the 5 Element Pagoda facing the other side of the charm is popularly known to be the most promising remedy against the Fatal Yellow Star #5. Note: This item is energy infused. Favored by most feng shui masters, the windchime is known to be the easiest way to remedy bad star numbers in any living space. Leading to new perspective in the design of windchimes, this enchanting windchime has an actual sparkling 2-inch Five Element Pagoda as its leading piece. Consisting of 6 molded mantra rods inscribed clearly with the all-time-favorite "Om Mani Padme Hum" and gilded with gold, it provides a special channel to the cosmic realm to invoke divine help to transform bad energies into good vibes. The center piece and the weight below remains unboldly traditional with the "bagua chao chye coin", which has proven its ability as a booster to counter pesky star numbers. The six rods actually denotes "Chien Hexagram" from the studies of I-Ching which carries the meaning Big Metal and luck from heaven. This hexagram exerts the strongest form of metal energy which is required to counter problematic earth energy from flying stars #5, whether they are of natal, annual or monthly nature. The deadly #5 Yellow brings fatality and bankruptcy if not remedied. In 2013, this annual star flies to the CENTER of all homes. This windchime can also be hung in sectors where Mountain Star #5 and Water Star #5 are from the birth chart of the house. Favored by most feng shui masters, the windchime is known to be the easiest way to remedy bad star numbers in any living space. Its leading piece is a twin wulou adorned with auspicious mantra, incantation, symbols and images which blissfully sends powerful protection for your health from the heaven and endless good health luck. There is a magical health protection taoist incantation that will improve ones immune system and remove "yin parasites" (as a result of the act of evil spirits). Consisting of 6 molded mantra rods inscribed clearly with the all-time-favorite "Om Mani Padme Hum" and gilded with gold, it provides a special channel to the cosmic realm to invoke divine help to transform bad energies into good vibes. The six rods actually denotes "Chien Hexagram" from the studies of I-Ching which carries the meaning Big Metal and luck from heaven. This hexagram exerts the strongest form of metal energy which is required to counter problematic earth energy from flying stars #2, whether they are of natal, annual or monthly nature. The Illness #2 Black brings long term illnesses if not remedied. In 2013, this annual star flies to the SOUTHWEST of all homes. This windchime can also be hung in sectors where Mountain Star #2 and Water Star #2 are from the birth chart of the house. 1. It can be hung in the NE to usher in Period 8 energy. 2. It can be hung at chi entry points such as the maindoor to announce "prosperity has arrived". 3. It can be hung in the west to activate descendants luck. 4. It can be hung in the northwest to favor the partriach luck. 5. It can be hung in the north to activate career luck. 6. It can be hung in natal or annual flying stars #1, #6 and #8 sectors to activate them for success, windfall and prosperity. If hanging a windchime from the ceiling is inconvenient, then the other option will be to hang it on the wall or at the door. This 6-hollow rods windchime is made for this specific purpose. Made from all bronze, it has the symbol of mystic knot on top. The mystic knot is the most influential symbol in Period 8. Those displaying this powerful mystic knot symbol will have the influence of the number 8 multiplied, thus enjoy extra good fortune. Mystic knot is also equivalent to the infinity sign done endless times.This windchime is used widely to cure the annual 5-Yellow and Illness Star 2. If hanging a windchime from the ceiling is inconvenient, then the other option will be to hang it on the wall or at the door. 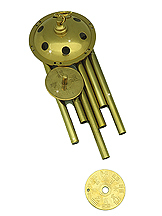 This 8-hollow rods windchime is made for this specific purpose. Consisting of 8 molded mantra rods inscribed clearly with the all-time-favorite "Om Mani Padme Hum" and gilded with gold, it provides a special channel to the cosmic realm to invoke divine blessing for good luck. Made from all brass, it has the symbol of mystic knot on top. The mystic knot is the most influential symbol in Period 8. Those displaying this powerful mystic knot symbol will have the influence of the number 8 multiplied, thus enjoy extra good fortune. Mystic knot is also equivalent to the infinity sign done endless times. 8 rods represents PROSPERITY BLESSINGS (fatt) and is the most popularly wanted number by Chinese. 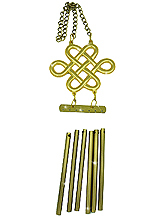 This is the kind of windchime that brings in prosperity luck and especially popular in its usage in Period 8 (2004-2023). They are normally hung in the NE to usher in Period 8 energy. One may also hang it in chi entry points such as the maindoor to announce "prosperity has arrived". 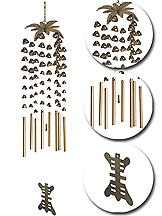 This is the popular 6-hollow all brass rods windchime made according to Feng Shui principle, dimension and its intended usage. It is made from heavy brass, with a special wu lou (calabash) designed on the top side of the windchime to cure illness star number 2 or to absorb any other illness energy. Besides there is also the bagua trigram designed as the center piece that knocks the 6 hollow rods. A fortune coin with bagua is designed at the tail of the windchime to bring unlimited good fortune to households and premises that hang this windchime. This windchime is used widely to cure the annual 5-Yellow and Illness Star 2. This heavy duty windchime is made with 5 thick tier layers and 6 hollow rods to provide a stronger cure against situations that one thinks are difficult. 5-tiers represent complete representation of the five elements, ie Metal, wood, water, fire and earth. It also represents the guardian of 5 directions by emperors. Meanwhile the 5 wulou's on every tier will help to cure all illness energies from 5 directions. This leads to overall improvement of fortune and good luck, while overpowering or subduing bad luck with 6 rods. This windchime can be used as cures for toilets in wrong orientation and places afflicted with poison arrows and bad energy, especially if one suspects the lighter windchimes tried did not work so well. Meanwhile the 6 hollow rods represent the CHIEN HEXAGRAM (big metal) to subdue bad earth energy of Illness Star#2 or Fatal 5 Yellow. Besides there is also the bagua trigrams designed as the center piece that knocks the 6 hollow rods. A fortune coin with bagua is designed in the tail of the windchime to bring unlimited good fortune to households and premises that hang this windchime. This windchime is indeed a stronger cure against the annual #5 Yellow and Illness Star #2. 5 rods represents EARTH and attracts excellent chi and prosperity from 5 cardinal directions, namely North, South, East, West and Center. 5-tiers Pagoda represents complete representation of the five elements, ie Metal, wood, water, fire and earth. It also represents the guardian of 5 directions by emperors. This leads to overall improvement of fortune and good luck, while overpowering or subduing bad luck coming from all the 5 directions. This windchime is normally used as cures for toilets in wrong orientation and places afflicted with poison arrows and bad energy. Made with light metal, they produce very nice musical tones when blowed by wind. There are 5 tiers altogether in the shape of a pagoda to assure potency. The bells are to complement the tone and melody of the windchime as wind blows to usher in good fortune and wealth luck. There is also a hanging piece at the bottom which symbolizes longevity or "sau" in chinese. 5 rods represents EARTH and attracts excellent chi and prosperity from 5 cardinal directions, namely North, South, East, West and Center. 7-tiers Pagoda signifies seven treasures of Buddhism. It accumulates benevolance. It is also said to symbolize blessing from seven northern stars which brings ultimate wealth luck and career luck. 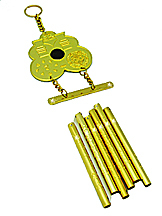 This windchime is normally used to nourish chi entry points to usher in good luck and can also be used to represent Wen Chang Pagoda in activating romance and scholastic luck when hung in Star #4 positions. Made with light metal, they produce very nice musical tones when blowed by wind. There are 5 tiers altogether in the shape of a pagoda to assure potency. The bells are to complement the tone and melody of the windchime as wind blows to usher in good fortune and wealth luck. There is also a hanging piece at the bottom which symbolizes longevity or "sau" in chinese. 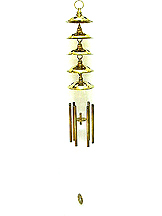 This is a traditional 8-rod chinese windchime specially made according to Feng Shui principles and usage. 8 rods represents PROSPERITY BLESSINGS (fatt) and is the most popularly wanted number by Chinese. 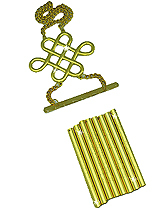 This is the kind of windchime that brings in prosperity luck and especially popular in its usage in Period 8 (2004-2023). They are normally hung in the NE to usher in Period 8 energy. One may also hang it in chi entry points such as the maindoor to announce "prosperity has arrived". Made from light metal, they produce very nice harmonic melodies when blown by wind. There are multiple bells to complement the fine and soothing tones of the windchime. Ringing bells also bring wealth luck and prosperity.